Security films have traditionally been installed using a technique known as a daylight application. The shatter film is applied to the window and bonded to the glass when the pressure sensitive adhesive is activated by a mild solution of dishwashing detergent and water. Excess fragment retention film is then trimmed to fit against the window's gaskets to create a finished product. After the tragedy of Oklahoma City in 1995, consideration was given to the fact that the entire glass pane could be blown out of the frame given a severe explosion. Security film manufacturers responded to this additional threat by developing attachment systems that are meant to bond the film to the glass to the window frame. 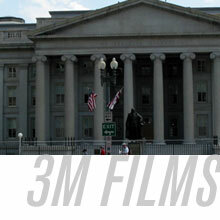 3M Company manufactures two different attachment systems: Impact Protection Adhesive and Impact Protection Profile. 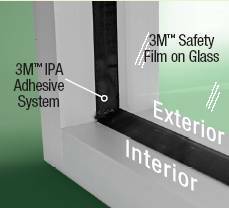 IPA is a high strength structural silicone adhesive to anchor the security film, glass, and window frame to each other. The anti-shatter film is applied to the glass in a fashion similar to that of a daylight application except that the gaskets are trimmed and the film's edges are inserted behind the window frame. A ½” bead of silicone is then applied flush against the frame to overlap the security film and take the place of the original gaskets. 3M's IPP provides similar benefits to the IPA, plus it offers a clean, factory-finished appearance to the window. It features a flexible gasket-style attachment that bonds the filmed window and frame by incorporating 3M VHB™ (Very High Bond) Tape. 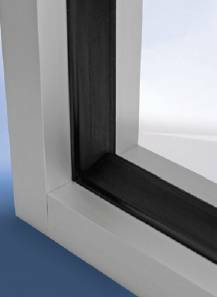 It adapts easily to most window frames and often can be installed without cutting existing gaskets. The IPP can also be retrofitted to existing safety film applications for increased protection. Available in black in two different sizes for commercial applications or white for residential applications, it adds real security to the window in an aesthetically pleasing manner.